One of the most interesting series on television was a documentary the BBC screened a little while ago about Leonardo da Vinci and his inventions. It mixed drama and explanation and opinion from a variety of historians and scholars to trace the life and scientific exploration and discoveries of one of the very greatest geniuses of the Renaissance. It was fascinating viewing, particularly when they tried out da Vinci’s design for a diving suit in the canals of Venice. Da Vinci was truly a polymath, responsible for a number of amazing inventions well before his time, such as the caterpillar track and helicopter. I don’t believe, however, that Leonardo was quite the isolated figure as is the common impression of him. There were other engineers at the time working on some of the same problems. 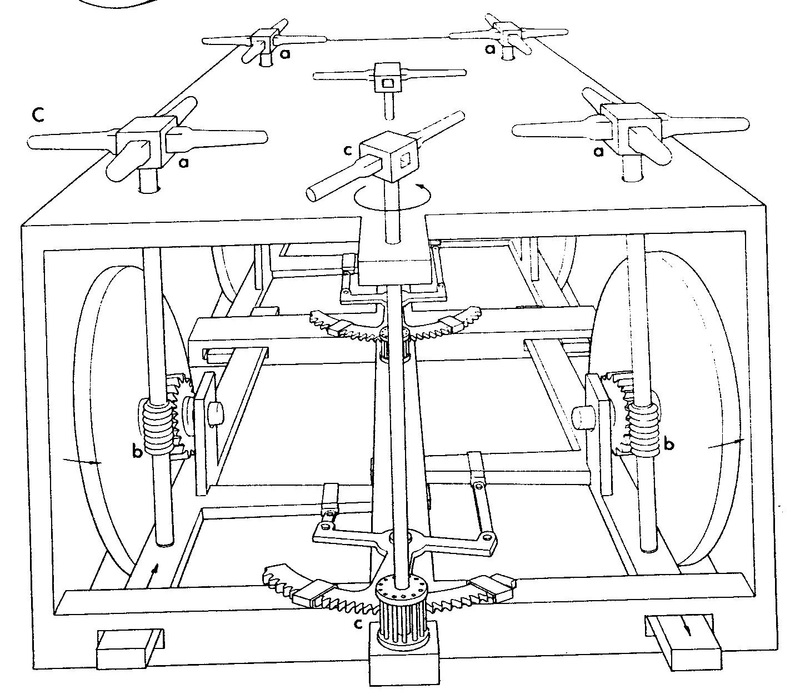 Jean Gimpel, in his The Medieval Machine, traces some of da Vinci’s ideas back to the thirteenth century French engineer and inventor, Villard de Honnecourt. This has been challenged, and other historians have science have rejected the suggestion that he influenced da Vinci. Nevertheless, it appears that de Honnecourt and da Vinci did work on some of the same problems, even if de Honnecourt never developed his ideas to the same extent that da Vinci did his. In the 14th century another, unknown engineer, began to consider an alternative method of propulsion for ships. 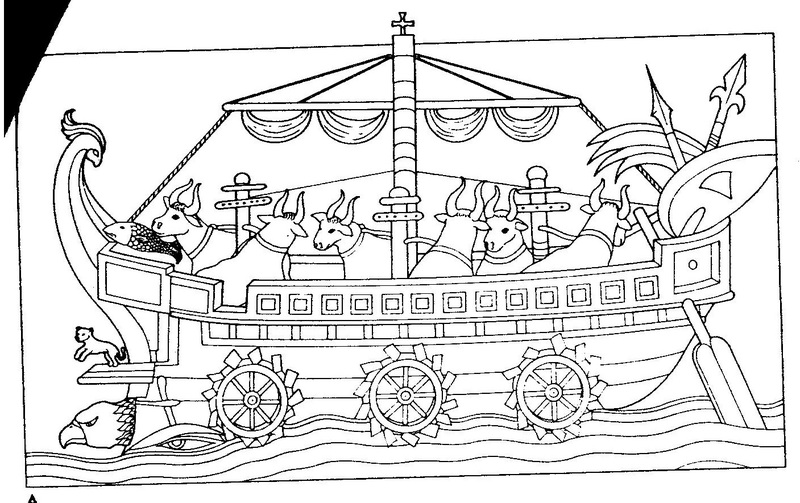 There’s an illustration from a manuscript of 1436 of a paddle-ship, whose wheels are turned by the oxen on board. During the fifteenth century a number of Italian engineers attempted to design something like the modern car. 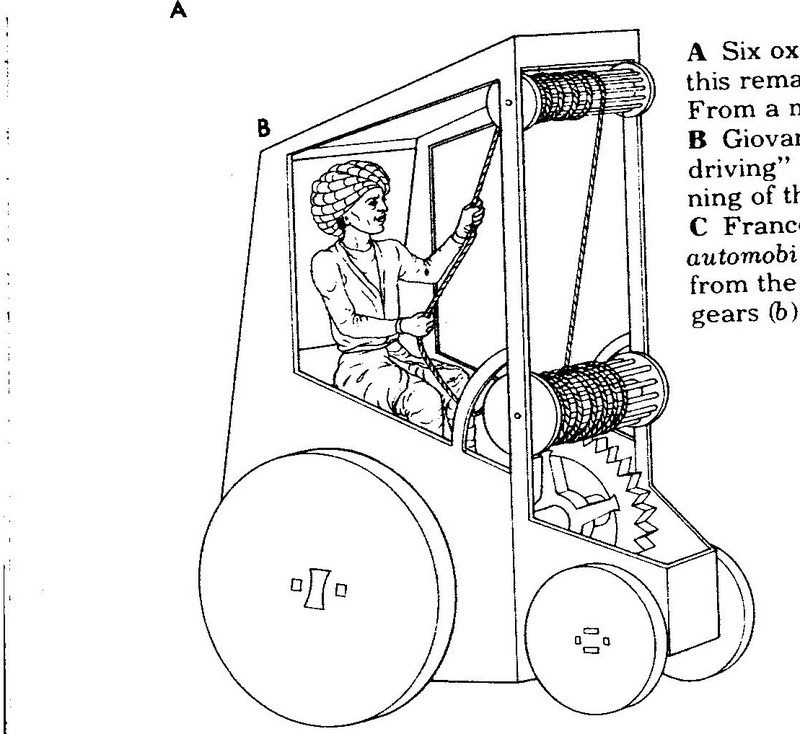 Around 1410, Giovanni da Fontana produced the design below for a ‘self-driving’ carriage, operated by hand. 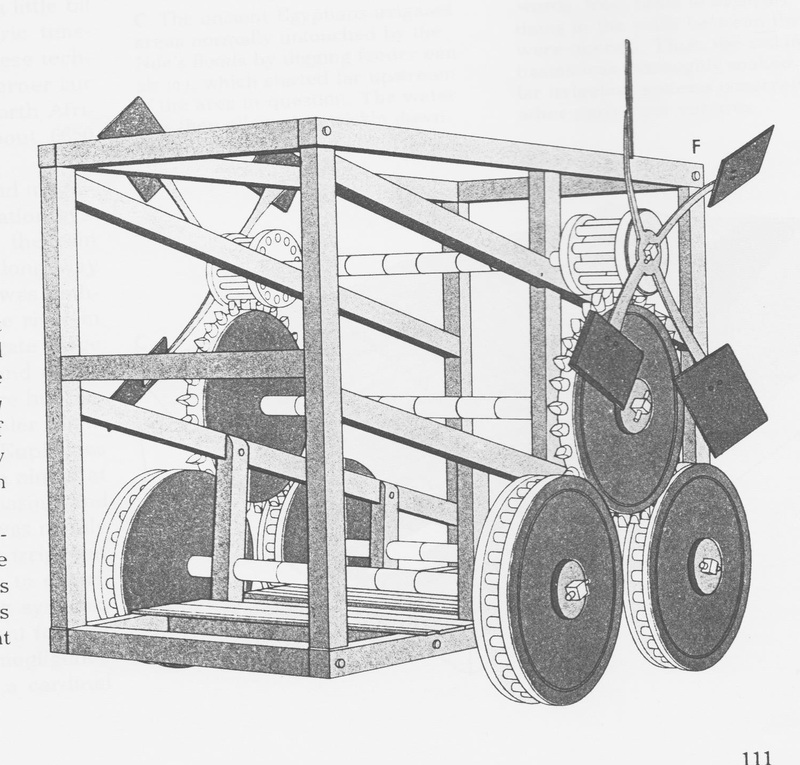 The car designed by Francesco di Giorgio Martini was powered by four capstans, each serving one of the vehicle’s wheels. It even had a steering wheel. Di Giorgio Martini called his vehicle an automobile, which is probably the earliest use of the term to describe something like the modern car. Roberto Valturio, who died in 1484, designed a carriage that would be driven by the wind. Mounted on each side of the car’s frame were two windmills, each with four incline sails. These turned another, large will, which communicated the power to the two wheels underneath it. In Germany, Konrad Kyeser invented a double crane, while di Giorgio Martini created a device for lifting columns. De Kyeser also invented a diving suit. Two types of these suits are shown in one of his illustrations dating to 1400. One of the suits is from a design of the fourth century Roman scholar, Vegecius. This is simply a helmet and a leather tube, through which the diver breathed, leading to a floating bladder on the surface. This type of diving suit may have already been in use long before. In 1240 Roger Bacon stated that there were ‘instruments which men could use to walk on the bed of the sea or of rivers without endangering themselves’. The other diving suit drawn by Kyeser showed a helmet with two glass holes for the eyes, fixed to a tabard belted on the wearer. This is the first known representation of a body suit. In 1582 another German engineer, Peter Morice, or Moritz, installed a tide mill near London. This operated a force pump with enough power to supply the city of London. Unfortunately, you rarely hear about these other, fascinating medieval and Renaissance inventions. Perhaps this may change with the increasing influence in Cyberpunk science fiction, which fantastically explores the scientific possibilities of the Victorian period. Possibly this type of SF may encourage others to look even further back in time, to the forgotten inventions and inventors of the Middle Ages and Renaissance. The role-playing game, Ars Magica is already set in the Middle Ages, and is based both on the world of medieval magic and their scientific worldview. Many of its players are historians of medieval science at universities. Perhaps in time knowledge of these inventions and achievements won’t be limited to the relatively small number of people, who play RPGs, and these engineers and inventors will at last receive the recognition they deserve from the wider public. Great Inventions through History (Edinburgh: W&R Chambers 1991. Sigvard Strandh, Machines: An Illustrated History (Nordbok 1979).